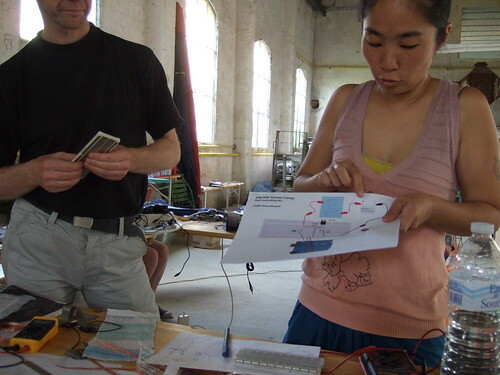 In this skill-share workshop, we will introduce how to build the heating circuit for your thermochromic project or Nitinol wire project. We will explore following questions: Which conductive materials can be used as a heat element, what are important properties to look for in any conductive materials? What has better be bought, what can you make (eg knit) yourself? How to control the heating sequence with Arduino (or other microcontroller) using transistor or relay? What kind of real energy source do you need for heating? Which batteries or power adaptor should you use? What kind of heating effect, expression, can be expected in this simple setup? 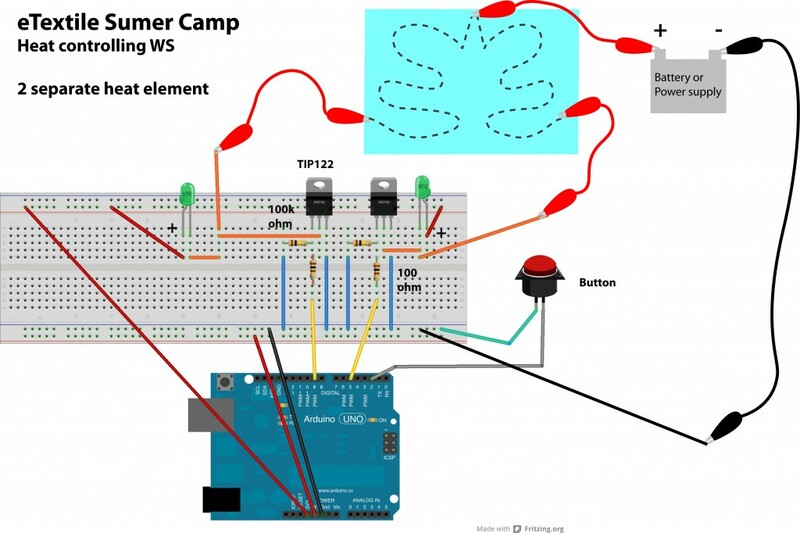 Participants will explore various heat element designs and build a circuit with Arduino and a sensor, which triggers and controls heating sequences applied on the heat element. The most important property of the heating circuit is the total resistance of the heating wire (or network, surface). Low resistance materials: low = for your total heating wire pad around 5 Ohm. Middle resistance: middle is resulting in 20-50 Ohm for your total heating wire. High resistance, like K Ohm’s, this material is not vey useful for heating pad’s. So low resistance wires are used for single lines of heating, the somewhat higher resistance conductive wires are used in networks of wires, (heating pad’s), where you want to heat a surface. Depending on the length or the total surface (e.g. 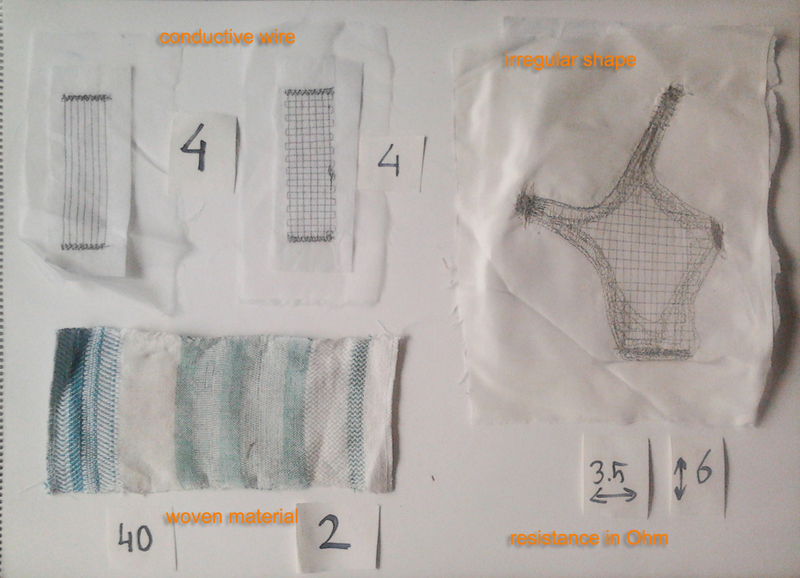 conductive fabrics) you choose for the conductive material giving the right total resistance. Then depending on the total resistance you can lower or raise the Voltage used. 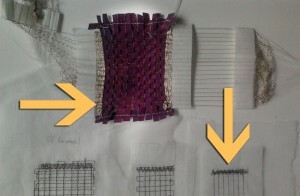 You can sew conductive thread on fabric, or knit conductive thread with a knitting machine, use it into woven materials. In my experience, if you just use a conductive wire and apply some voltage to it either nothing happens, or you start a fire…too less or too much energy is applied to the heating pad. To be able to know what happens you need a few formula’s. inserting the law of Ohm into the Energy formula. So when R = 0 or nearly 0, you get infinite or too much energy, called a shortcut, and things will start burning…but if R=1000 and V=5 not much will happen. You can calculate an example using the 6 Ohms and 5V, that the current is around 1000 mA (law of Ohm) and the energy is around 5Watt (Watt is the unit of energy). This is a good heating value for a small pad. When you apply less warmth, it takes longer to become hot. What if you happen to have a higher resistance? Say 100 Ohm. Then because the dependance on V is quadratic you just need to increase the voltage to around 20 V to get the same amount of energy generated. The other way around: say you measure your pad to be 1-2 Ohm, than probably 3V is enough. 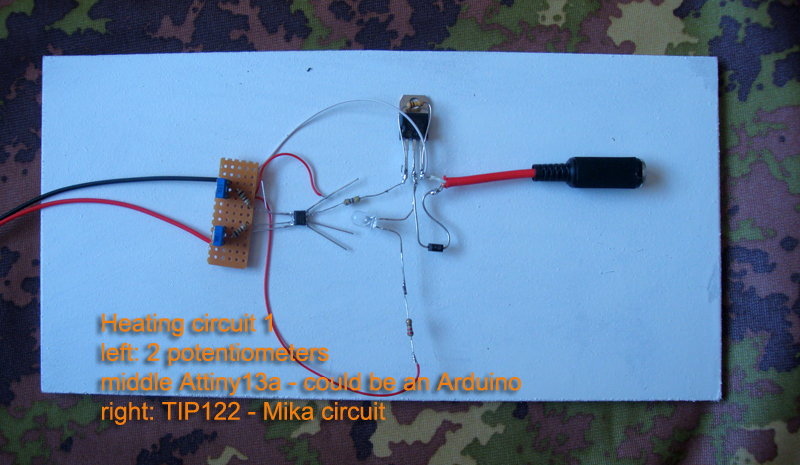 In the workshop, we built the following circuit to control heating line(s) with TIP122. The effects of heat on fabrics with Thermo Chromic ink will be dependent on the material you applied the thermo ink on. silk screening is producing a thicker (less sensitive) layer. and also the room temperature (or ambient temperature) you experience. During the workshop the ambient temperature was 20-25 degrees Celsius, ideal for getting color change. In winter you have to heat more to get the same effect, if it is too hot (30 degrees) the effect is already taken care of by the summer, and nothing happens anymore! That is why in every pad I made there are two big very conductive spot to connect the crocodile clamps. Heating is spending energy. Actually currents around 500mA – 1A are huge compared to what you normally want to use for microcontrollers. So it is useful to think how you could make this enormous amount of energy still as small as possible. The formula for energy indicates that energy is quadratic in Voltage so lowering the voltage is saving energy. But this is only possible if your heating pad is having a low resistance. You accept that the heating is slow. You can also experiment with heating for a few seconds and then not heating, heating and not heating. Probably the thermo effect is not diminishing due to isolation or saturation, and you can save 50% of the energy. This periodical on and off can be done in the microcontroller (Arduino or other), just in the script, using the delay (or the milliseconds). The examples down below with the relay and the phototriac have small potentiometers which allow you to set the on and the off time. 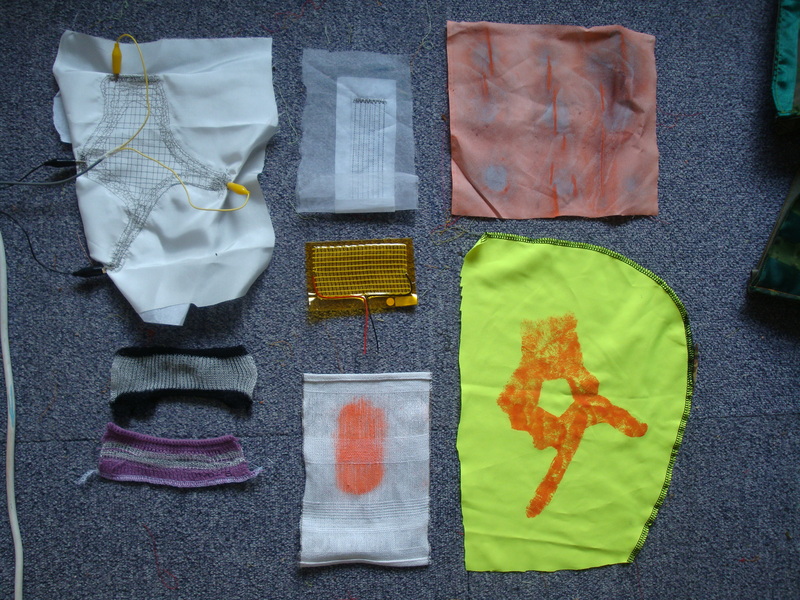 The source you will use depends on many factors: do you make a wearable or not. If not you can use an adaptor. 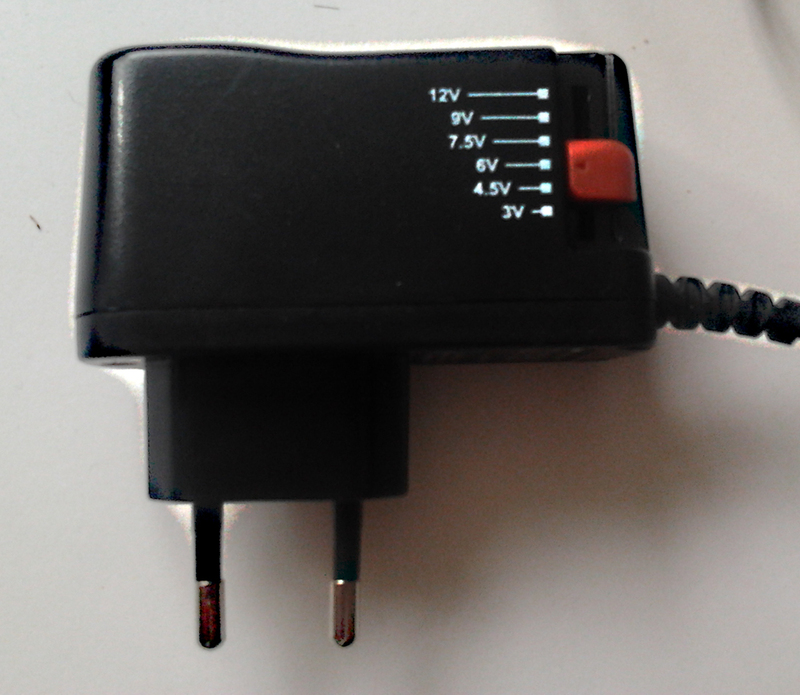 For experimenting you could use an adaptor having a range of voltages from 3V up to 12V is useful. If you want to make it wearable you need batteries. 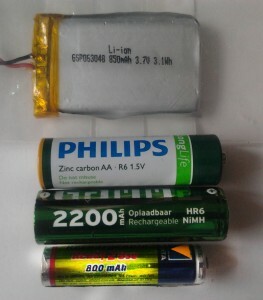 Then look at the indications of the batteries. You can discover an indication of the energy that the battery can spend. For example 2100mAh means that it has 2100mA for one hour at 1.5 V.
Batteries are used either parallel (more current, same voltage), or in series (voltage adding, same current). For example you need three AA cells in series, making 4.5 Volt. This means this battery array of 3 AA cells can give around 10Watt (energy =V*I), depending on efficiency and how far you can empty the battery this is less than the indicated value. When using the 5V at 1000 mA means you can heat for 2 hours. The LIPO cell also has an indication: 800 mAh, there are LIPO’s up to 6000 mAh, combining cellls.The LIPO has a Voltage of 3.7, so the total energy is 3.1Watt for one hour. Now you can calculate a bit what you need, and have an idea of how long it can last. Other components for separated circuits. A relay is a switch which operates with a magnet. So the switch is not part of the circuit of the Arduino. This has an advantage: a relay can switch whatever you want, even washing machines (be careful and choose the right relay). A phototriac is a switch using a LED and a LDR inside a small box. 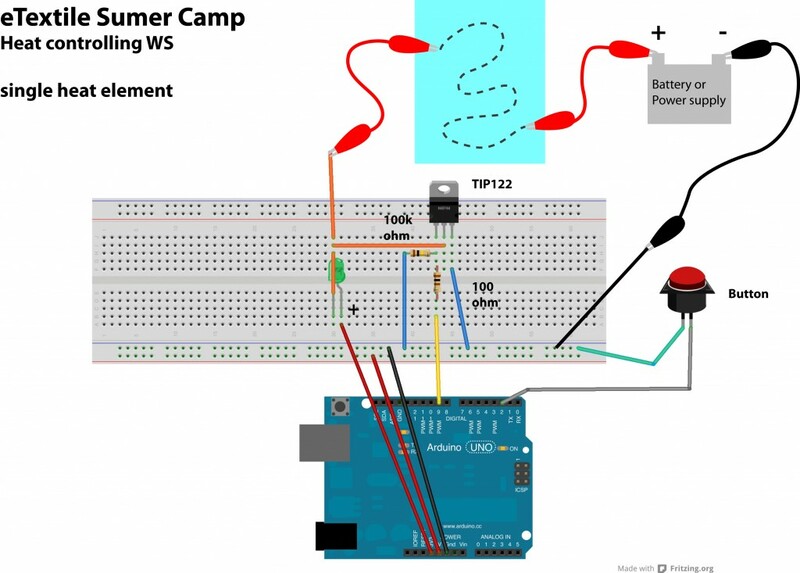 The LED is connected to the Arduino (like a normal LED) and the LDR is part of a separated circuit. 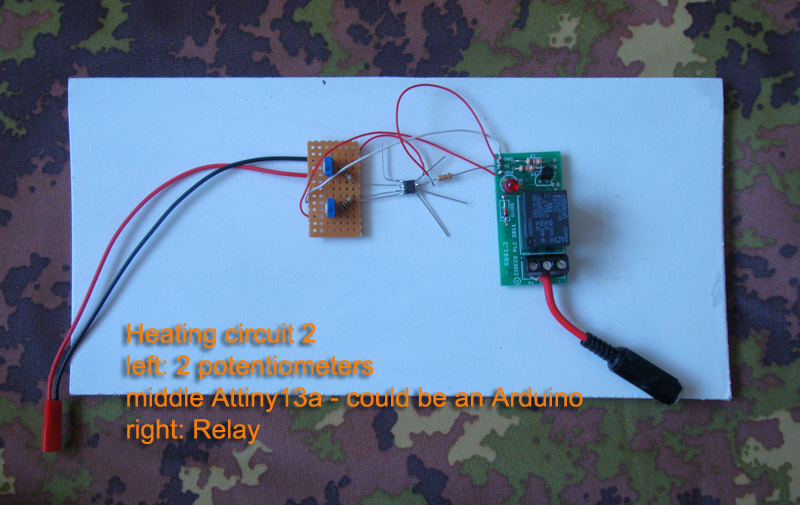 Both the relay and the phototriac can be consisdered as LED’s as far as the Arduino (of chip) script is concerned. So just a simple LED circuit and script is enough. For the workshop I prepared three demo devices with chip’s programmed so that you can configure on and off time, with to small potentiometers. 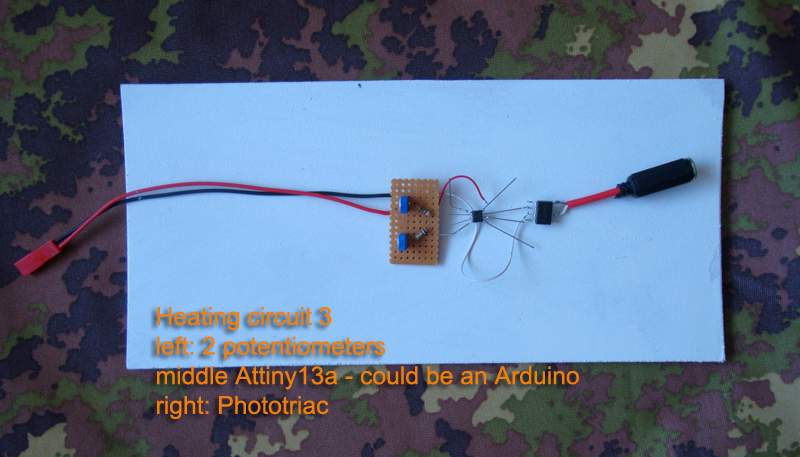 Instead of an Arduino I used the cheaper Attiny13A. Separated circuits, Arduino circuit and heating circuit. The reason to separate the circuits is to be able to let the Arduin (or chip) run on its own Voltage and be free to apply a higher voltage to the heating circuit. Details: the two potentiometers on the right are used to vary the heat-ON time and the heat-OFF time. They are connected to 2 analog PINS. Beside that there is one PIN used like a LED to switch ON or OFF the bigger switching device (TIP122, Relay, Phototriac). I used Attiny13a (the spider in the middle of the picture) instead of an Arduino, because this Attiny is only 60 cents, and saves me an Arduino of 30 euro’s. The script is small and easy. 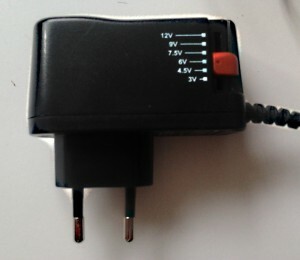 The bulky black plug at the right will be inserted in the heating circuit. The Attiny13a will be controlling this switch. This is heating circuit 2, using a relay. This is heating circuit 2, using a phototriac.